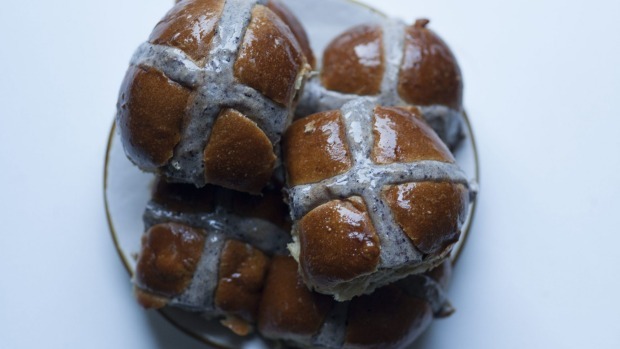 With hot cross buns hitting supermarkets when most of us are still reheating Christmas pudding, it's easy to take the Easter treats for granted. The week or two leading up to Good Friday, however, is when most proper bakers (that is, places that don't also sell toothpaste and rotisserie chooks) pick up the piping bag for a round of hot-crossed action. It's a time to shake off the shackles of bun overload and get buttering. HXB riffs are on the menu at a few Sydney restaurants, too. Chefs Monty and Jaci Koludrovic are spreading love and butter with "hot peace buns" at Icebergs Dining Room and Bar. 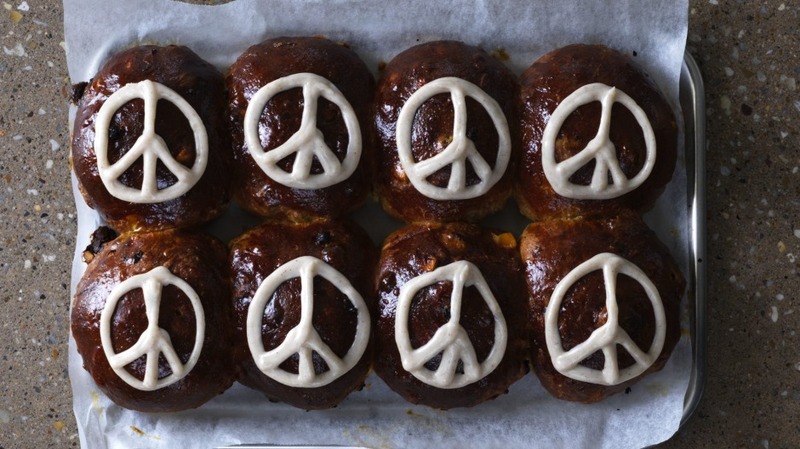 The sticky "inclusion buns" topped with a spiced milk peace sign will feature on the Bondi restaurant's brunch menu on Easter Sunday and maybe for a few weekends afterwards. "They're not tied to the church so we can serve them whenever we want," says Monty Koludrovic. Meanwhile, Cornersmith's Annandale store is baking its version of the classic with a sweet explosion of candied orange peel (made from oranges traded with customers last citrus season), mixed dried fruit, figs and a blueberry cross. 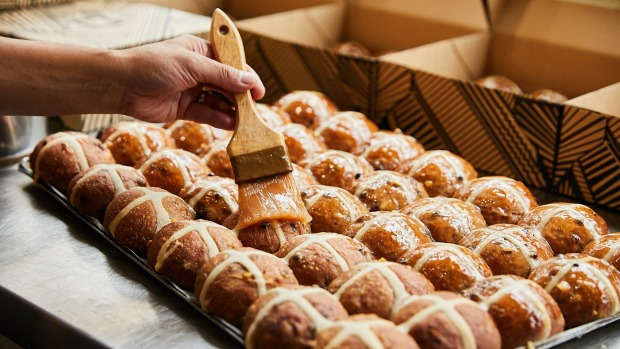 For hot cross buns you can take home in a six-pack, here are six of the best bakers providing the Good Friday goods in Sydney. 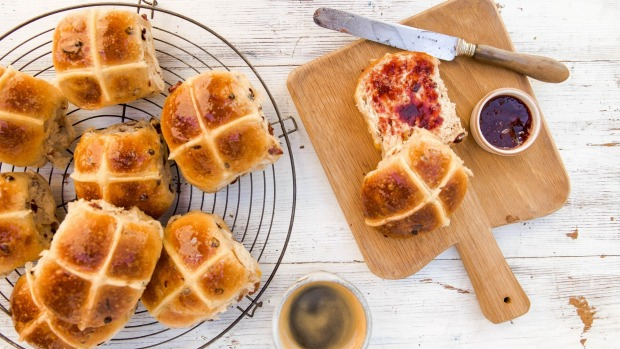 The sourdough trendsetter has baked "not cross buns" since 2012, marked with an "S" instead of a cross and filled with sultanas, raisins, apricots, cranberries and candied orange. This year Sonoma has adopted a Japanese baking technique known as the tangzhong method for the first time whereby a water roux traps and retains moisture to make the buns extra soft for longer without the need for preservatives. Also available in a dark chocolate and sour cherry version on the Easter weekend. $3.50 each or six for $20. Vegan buns with a frankincense glaze? Welcome to Newtown. "Our frankincense hot cross buns were originally made with butter and eggs but with BlackStar being in Newtown it meant a lot of our vegan customers were missing out," says Christopher Thé, the watermelon cake company's founder and creative director. When butter is removed from a recipe in vegan baking, and replaced with something like vegetable oil, a lot of the nutty complexity butter brings to a bun is lost, says Thé. He won't provide exact details for BlackStar's top secret bun recipe but says flavoured oils and a whole lot of lemon zest are involved to give back what was lost and add layers of flavour of their own. $4.50 each or six for $25. "That's not a bun, this is a bun." Or rather, a bloody big hot cross loaf waiting for you to toast a slice and drown it something that's probably not great for cholesterol levels but it's the long weekend so do what you want. BSB founders David McGuinness and Paul Allam have been making their festive loaf since the bakery opened in 2004. Buns are on the counter too, but McGuinness says he prefers the loaf because it's a little less dense due to a longer baking time. Loaves and traditional HXBs are made to the same recipe, which is basically a milk bun sweetened with brown sugar and studded with sultanas, currants and orange peel. Loaf $7; buns six for $14. Keiran McKay snubs Australian hot cross bun tradition at his tiny Dulwich Hill bakery by doing away with sultanas completely. McKay use dates and cranberries instead, which mingle with the bun's mixed spice for sweetness and tang. The slow-fermented buns use top quality Australian flour from Laucke and if you're in need of sourdough loaf for the Easter table, McKay bakes what might be the inner west's best. $2 each or six for $10. Gluten-free eaters can put Bake Bar on their hit list this Easter. 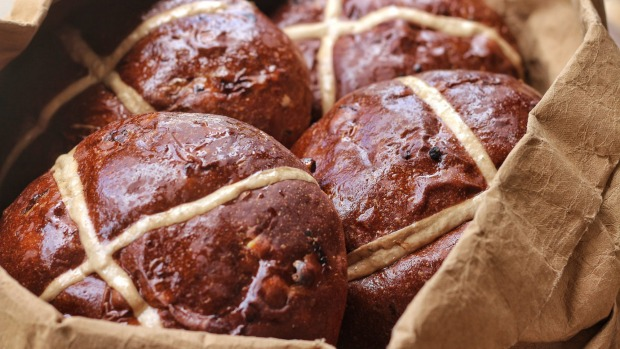 In response to demand for its gluten-free hot cross bun in 2018, the bakery has doubled its GF Easter offering across three stores. Bake Bar's traditional bun is still on the carte and both varieties contain organic sultanas, raisins and currants. Traditional $3 each; gluten-free $4 each. Sick of anemic supermarket buns featuring one sultana and a sliver of peel? We are too. Praise be, then, to Redfern's number one all-organic bakery, where buns are 25 per cent sultanas, currants, cranberries and candied orange soaked in a light vanilla syrup for 48 hours before baking. Breadfern's small size means it bakes two or three hot cross bun batches a day, ensuring consistent freshness and maximum spice aromas. $4 each.